BENEFITS OF OLIVE OIL SOAP - Olive Lab | Body care with extra virgin greek organic olive oil! OLIVELAB NATURALS manufactures products with 100% natural, certified materials. The main ingredient is the extra virgin organic olive oil – abundant produce of Greece and famous for its exceptional quality. The chemical reaction between oil/fat and alkali that creates soap is called “saponification” - derived from the Latin word, “sapo” and means “to make soap”. This is the soap making method that has been used since ancient times. Natural soap with extra virgin oganic olive oil is made with pure and simple ingredients that are good for your skin. In the natural soap making process, oils are combined with lye to produce soap and glycerin. 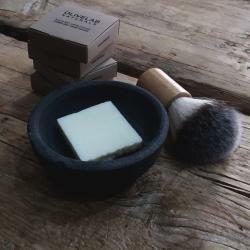 All soaps are made with lye and once the process of saponification is complete, the lye and oil molecules have chemically changed into soap and glycerin, until there is no lye remaining in the final bar of soap. Soap cleanses the skin while glycerin moisturizes it. Natural olive oil soap is best stored out of water so that it air dries. Let your soap on a draining soap dish or stand it on its side. If left in water, olive oil soap dissolves due to the soap and glycerine molecules that wash clean with water. Olive oil soap is considered to be the most mild of all soaps and can be used for any skin type even for the most sensitive skin. It contributes to healthier and more radiant skin and soothes skin conditions. It helps replenish the oils that your skin loses as we get older, gives a much smoother complexion and minimizes wrinkles. Natural soap helps you look and feel healthy at all times. It is hypoallergenic, so it is also the safest choice even for newborn infants. The anti-inflammatory effect of olive oil strengthens the immune system and protects the skin from diseases. Finally, the bar of natural soap is hard, does not lather much and lasts far more than similar products. 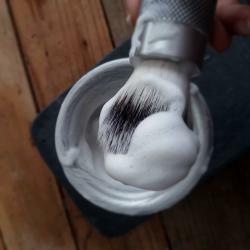 Handcrafted, shaving brush with antimicrobial synthetic loft and a minimalist beech wood handle. Beeswax ointment heals and protects your skin from dehydration. Taking your time for shaving can be an activity you are longing for, something nice for yourself! Sign up of our newsletter! Please insert your e-mail address! This is a mandatory field! Please choose a password with 6+ characters! Wrong user email or password! Please choose a password with 6+ characters! Please insert a valid telephone! This email already is already registered!